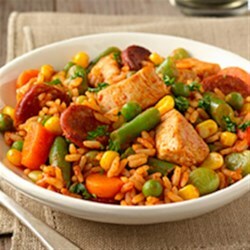 "Chunks of chicken and chorizo slices are cooked with a colorful blend of veggies until just done, then blended with white rice and broth for a quick and tasty weeknight dinner." Heat oil in large nonstick skillet over medium-high heat and cook chicken and chorizo, stirring frequently, 8 minutes or until chicken is almost done. Stir in prepared rice and chicken broth; heat through. Season, if desired, with salt and pepper. See how to make a classic Italian chicken dish. *Cook chicken to an internal temperature of 165 degrees F as measured with a food thermometer. The spice and flavor of the taco seasoning was really yummy. Will definitely make again and on a regular basis. Amazing! I didn't add the chorizo, and just added 2 lbs of chicken, plus threw in some more taco seasoning for some extra spice! It was super delicious and I will definitely be making it again! We loved this! I added shrimp. I also used cauliflower rice instead of the white rice. Soo good!